Empower your teams with Talent Management solutions. Provide managers with the tools to provide continuous feedback on employee activities connected to goals and key performance indicators, and to promote ongoing performance development, manage compensation, and stay on top of learning and development to advance skills. HybridHR offers the tools your teams need to conduct evaluations, nurture and develop employees, stay up-to-date on skills and training, and reward them for their efforts — all to create a more engaged, motivated, and productive workforce. Empower your teams with Talent Acquisition solutions. Automate your recruitment and staffing efforts during the employee application process. Help your field managers and recruiters find the quality talent your organization needs to compete in the talent wars with powerful applicant software. HybridHR talent acquisition tools provide one simplified solution for both high-volume and distributed hiring and centralized requisition-based recruiting for a streamlined, easy-to-use experience for candidates and hiring managers. 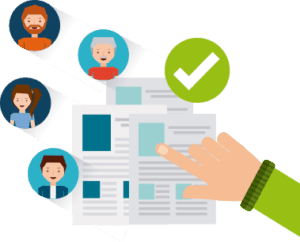 Our automated solution helps your teams recruit, screen, track, hire, and complete employee verification of best-fit candidates — to build a more engaged and productive workforce.